Welcome to my auctions. I am in the process of downsizing and am offering some items that I have had for many years. 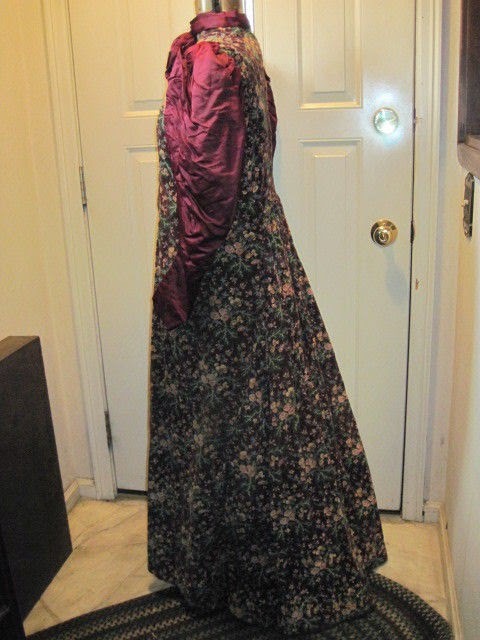 This auction is for an original 1890's Gibson Girl floral velvet print with wine colored satin sleeves house dress or morning wrapper. It is lined in brown cotton fabric. It was a wonderful gown at one time but it has since faded, torn and soiled. 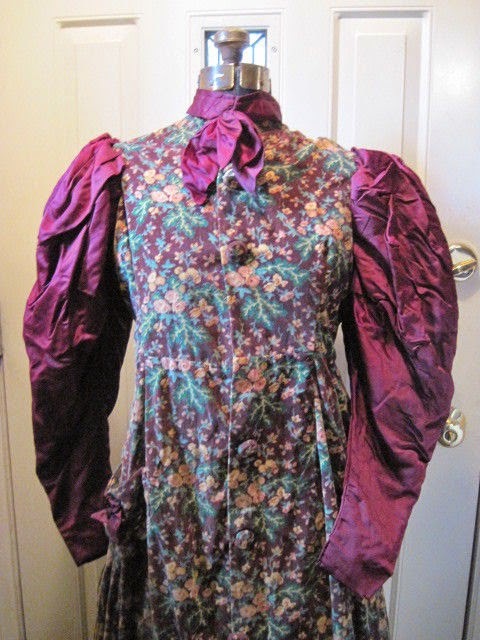 It was a wine-colored velvet with small golden colored flowers and pink rose buds and green leaves with wine colored satin mutton sleeves but it has faded to brown in some places. 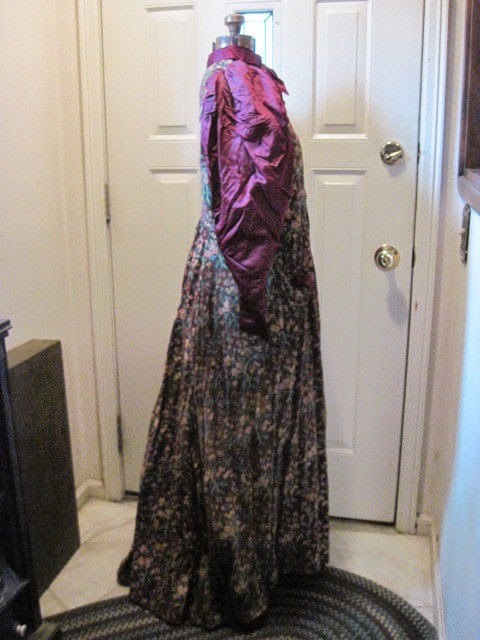 Most of the fading is on one side of the gown. It had a darling pocket but it has ripped over time. It could be removed. 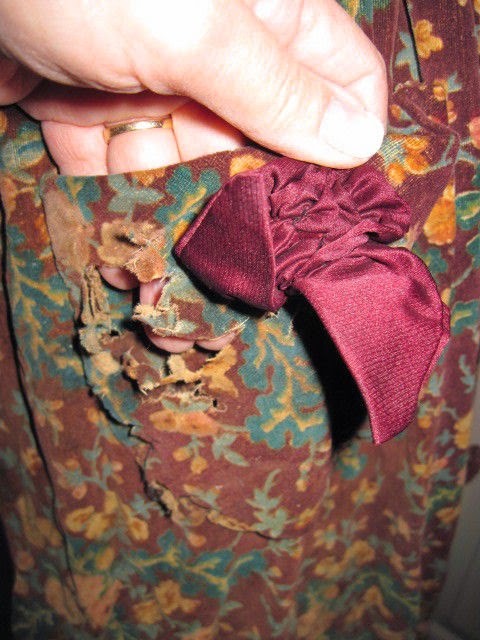 There is a cute bow on the pocket that could be salvaged to put on a new pocket of plain fabric. 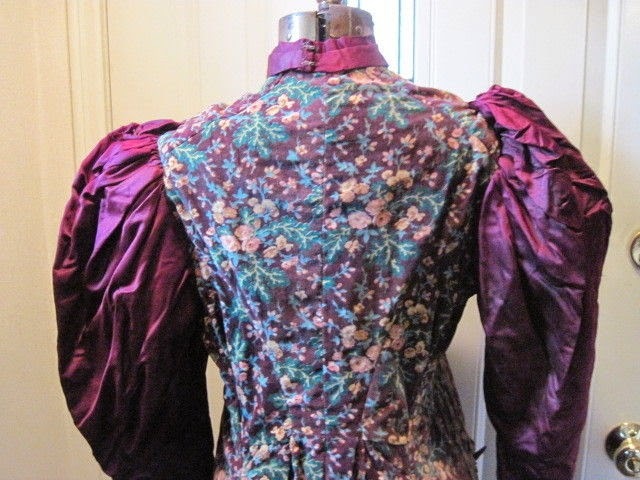 The 8 buttons are covered in the same fabric as the gown. The top button is torn. The button holes are hand stitched. The 5 bottom buttons were just for looks and are stitched in place. There is a burgundy neckpiece that is attached that has a bow in front. There is mild underarm staining. 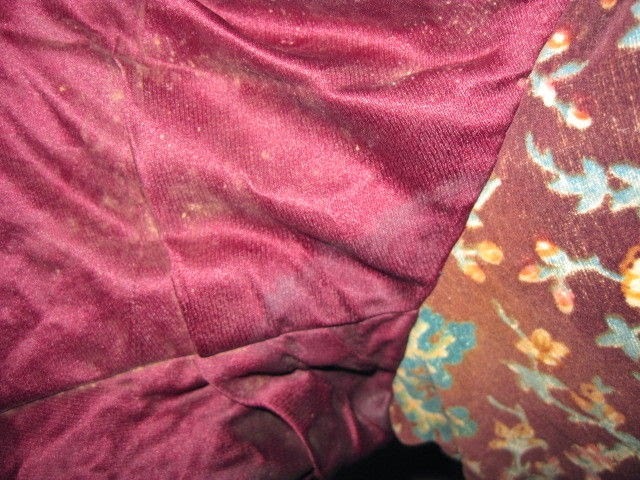 There are several holes in the faded velvet fabric. 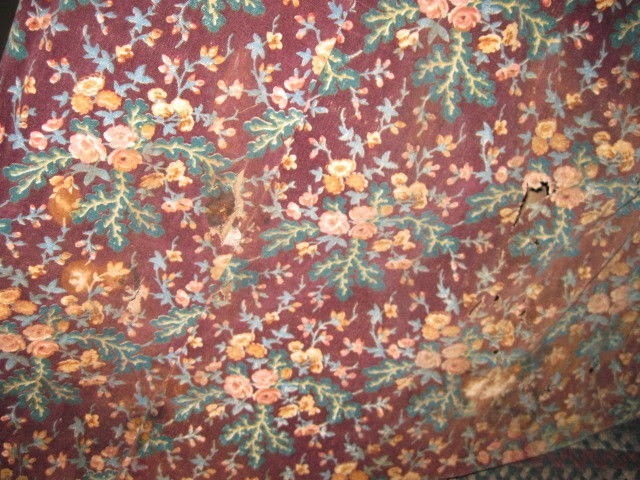 It looks like it got wet at one time and the lining deteriorated thus allowing the fabric to tear easier. The lining could be removed and replaced. 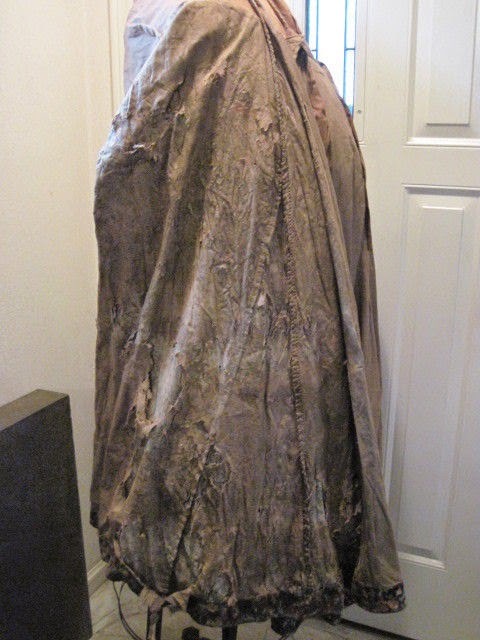 There are large areas where the fabric is not faded or torn--probably about half of the gown. There is a 3" tear at the hem of the dress that has been repaired. There is a belt inside at the waistline to pull the gown in around your waist. there are some old safety pins holding part of the neckpiece in place and pulling the sleeves up at the shoulders. They have been in there so long that I could not remove them. 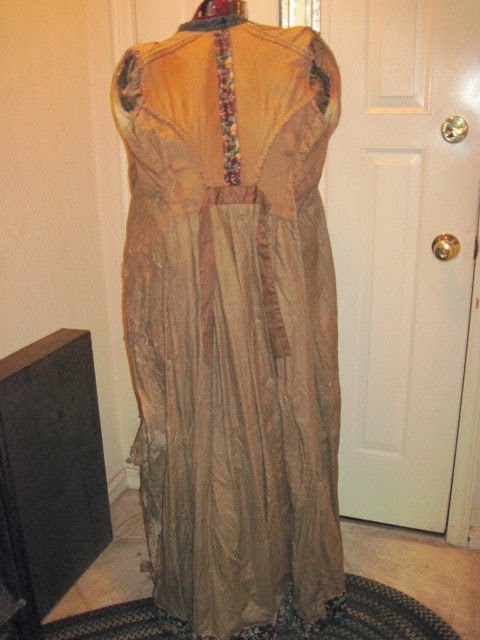 The gown could be used for a theatre costume or for study or salvage for fabric or sleeves. I am selling it as found. It would need to be cleaned if you plan to wear it. Please look at the photos for more detail. 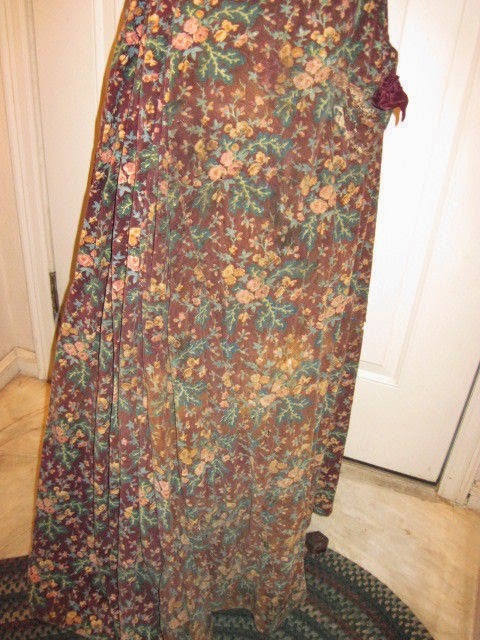 The skirt is lined and has a velvet brush all around the hem. There are no musty smells. I bought this one. :-) It's a beautiful velvet print. So beautiful, I've recreated the print on Spoonflower. Although Spoonflower can't print out velvet (yet! 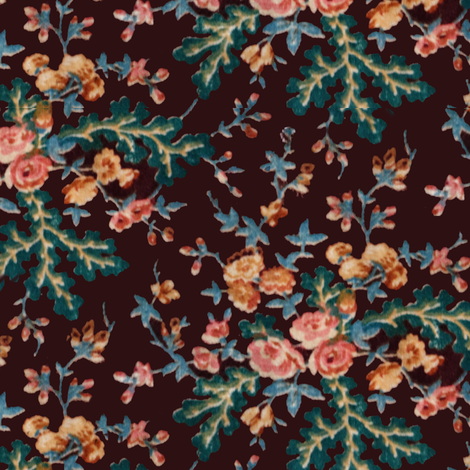 ), this would look equally awesome in a silk or cotton fabric. I really hope you enjoy this reproduction - I have a couple of others up as well. This one took me two days to get it right because of the way it repeats! Congratulations on your score! Such a gorgeous fabric! Oh, yes; the wonder of safety pins. I created a quickie costume for a child out of safety pins and fake fur. 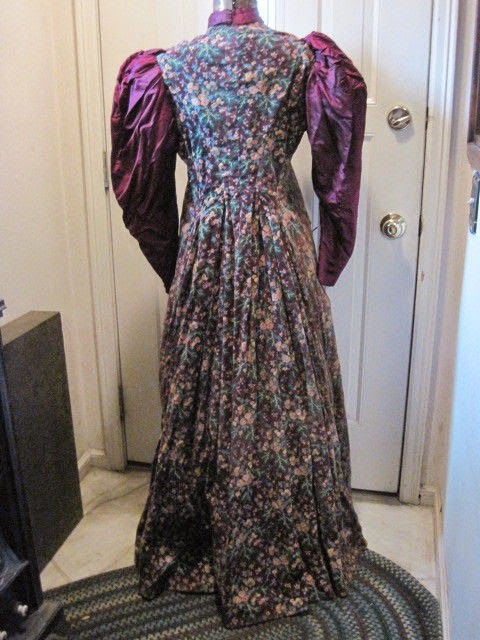 I love that you are recreating the fabrics from these beautiful old dresses! Thank you! Btw about your short stays pattern--do I buy it based on my bust measurement or my underbust measurement?